Dark circles are my kryptonite. They're basically the one thing on my face I'm constantly worried about. I stress when I don't get enough sleep, when I know I'll wake up puffy (courtesy of a few too many late-night beers), and when I'm trying to look good in photographs. Essentially, I could write an entire memoir about my time spent cursing them. (FYI: Here's how one of our editors permanently removed her under-eye bags.) Instead of continuing my tirade, I decided to ask a few experts about where exactly these issues come from. Turns out the under-eye ailment is pretty common, which is exactly why there are so many products marketed to rid you of darkness and circles. "There are two types of dark circles," Amy Fan, Onomie's general manager, tells me. "The first is under-eye circles with a bluish tinge, which are actually pools of blood underneath your eyes. The skin right below your eyes is very thin and delicate, and when blood pools, it shows right through." This has to do with fatigue and late nights. She continues, "The second is under-eye circles with a brown tint. This is usually caused by hyperpigmentation, which is partly genetic and can be exacerbated with sun exposure." For me, I suffer from both the former (I'm a night owl) and the latter, as my dark under-eye circles and bags are mostly genetic. My entire family tree has sported them. So I need something that works on both issues. I've spent hundreds if not thousands of dollars trying to figure it all out—on eye creams, serums, massagers, and the like. While I do have a few favorites, nothing has worked wonders and certainly not at a sustainable price. 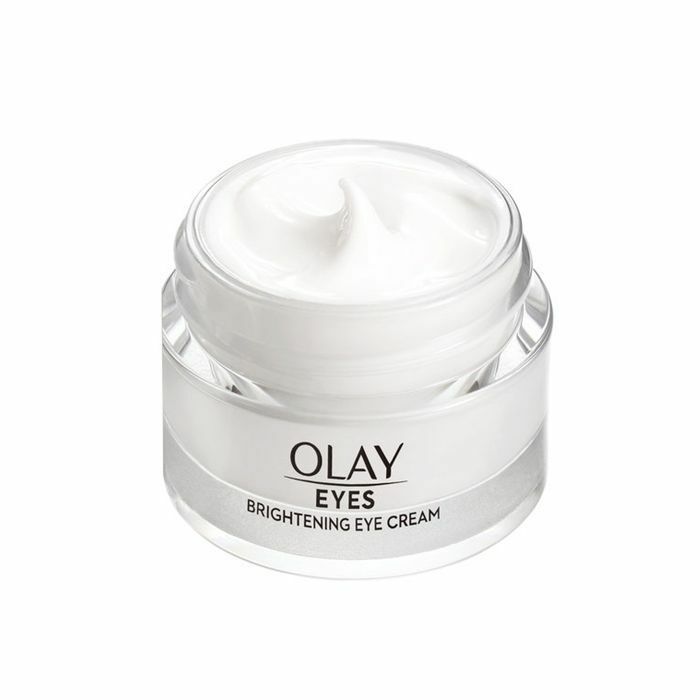 I was at my wit's end when I received an email about Olay's newest product, a brightening eye cream that costs $30. I might as well give it a try, I thought to myself and asked for a sample. Even before trying the product, I was already impressed. There is a lot of science-backed research behind this product. Frauke Neuser, the principal scientist for Olay, explains, "We ran a skin hydration study showing that the Olay Brightening Eye Cream hydrates better than several expensive eye creams costing $100, $200, $300, and even $400." She adds, "Because the skin around the eyes is the driest and thinnest skin on the whole face, intense hydration is a very important benefit any eye cream needs to deliver with excellence." Olay ran multiple clinical studies showing that niacinamide (which is a fancy term for vitamin B3), one of the key ingredients of the product, is really effective in reducing hyperpigmentation. The results showed niacinamide significantly decreased hyperpigmentation and increased skin brightness after four weeks of use. And it also includes vitamins C, E, and B12, as well as peptides for good measure. I was definitely game to give it a shot. Now, it's been two weeks, and I didn't even need to wait the full month to see results. Olay's formula is enriched with a light-reflecting complex to not just help reduce under-eye problems but also brighten, which means it works instantly and compounds results over time. It's a perfect morning product to apply under makeup (or on its own). At first touch, it's cooling, and the gel-like formula feels incredible to apply. I like to keep it in the fridge for added de-puffing benefits in the morning. I dab it on lightly (the skin under there is super delicate), let it absorb, and move on to my next step. I have noticed a real change in the area beneath my eyes, and I am the first one to admit I never thought I'd fall so deeply for a drugstore product. But I did. And I think you should too. FYI: This purple shampoo made our editorial director's platinum hair so, so bright—and it's only $8.